Christian Bale as Moses in "Exodus: Gods and Kings" -- no, he does not suppose his toeses are roses. 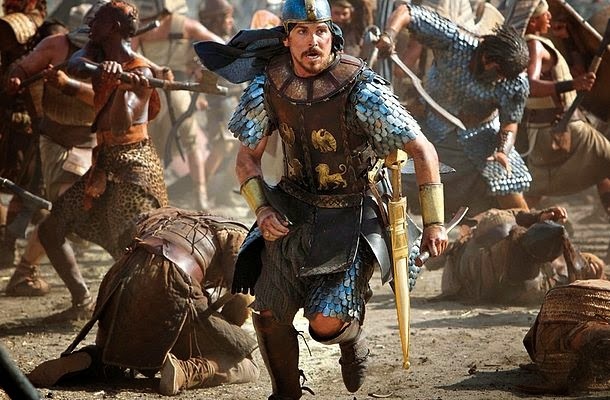 As eagerly as watchmen await the dawn, I yearned for the arrival of Ridley Scott’s new movie, “Exodus: Gods and Kings.” As the gorgeous, slow-motion train wreck unfolded before my eyes, I leaned back in satisfaction. Here was another classic misfire for the ages. Let me explain. I come from a family of Biblical-epic connoisseurs. As we are compulsive jokers whose religious beliefs range across the spectrum, leaning heavily by consensus towards nihilism, Biblical epics have been a touchstone of interactive family enjoyment for decades. Long before “Mystery Science Theater 3000,” we were seated before the TV, snacked up and ready to crack comic exegesis on “The Ten Commandments,” “King of Kings,” “The Bible: In the Beginning” and much, much worse. These showed up at regular yearly screenings on network TV, or came on via the opportunistic and short-lived SFM Holiday Network, which would tar over the holes in regular programming created by holidays. Having actually read and retained the Bible at one point, I was fascinated by the discrepancies between the Holy Word and Hollywood. I began to seek these scriptural extravaganzas out. (Maybe it was trauma – I was taken to John Huston’s “The Bible: In the Beginning” at the drive-in. Watching a 40-foot-tall George C. Scott overact as Abraham might have done it. Yep.) I have toiled through “Barabbas,” “Esther and the King,” even “The Big Fisherman” featuring Howard Keel as Saint Peter. So I came into the screening ready for anything. This factors in my love/hate relationship with Ridley Scott. As far as I can recall, his first film, “The Duellists,” is the only one I have ever sat through, gone out to the lobby, paid again, and watched straight through a second time. This is the guy who gave us “Blade Runner,” “Alien,” “Thelma and Louise.” And – and – “1492: Conquest of Paradise.” “G.I. Jane.” The Russell Crowe “Robin Hood.” You see what I mean? I’m conflicted. It’s particularly appropriate that Scott tackle the Moses story, as I think he has become our generation’s Cecil B. DeMille, just as I think of Spielberg as a modern-day John Ford. (Please note: I am aware that Scott has more talent in his pinkie than I have in my entire area code and that on his worst day he made more money than I will over the course of my entire life.) Like DeMille, Scott is addicted to scale. But what worked in a time when the shared values of the mainstream could sustain the mythic weight of the story didn’t work this time for Scott. How do you make a postmodern Biblical epic? Like “The Ten Commandments,” “Exodus: Gods and Kings” goes with the solid premise that all Egyptians walk around like they have poles up their bums and speak with, if not a British accent, a languid and effete tone and that the Hebrews are grungy, hairy, vernacular-speaking jist-plain-folks. We are quickly acquainted with Moses (Christian Bale) and his brother/rival Ramses (Joel Edgerton). Both are color-coordinated for ease in differentiation. Also, Bale is the only Egyptian sporting a full head of hair and a beard. Perhaps this is a bit of fore-five-o’clock-shadowing. The story was made for CGI. One thing that always frustrated me but DeMille’s work, especially in “The Ten Commandments,” is the flatness of the compositional plane. With rare exceptions, everything moves along in a two dimensions; the stagings, postures, and even line readings are as stiff as a local religious pageant might be. When Moses parts the Red Sea, a trio of women poses in a setup remindful of a Raphael composition. “The Ten Commandments” is meant to look like the faded religious prints handed out in Sunday school. DeMille’s presentation is steeped in tradition. Scott, frantically dynamic in comparison, plunges us into battle almost immediately in the new “Exodus,” and by minute 12 there has already been a major disembowelment of the entire Hittite nation by the two princely brothers. Scott seemingly makes references to Ford, Wellman, and even Nolan in this first huge action sequence, as if to unleash all the compositional framing and editing tropes and get them chucked over the shoulder properly before proceeding. In “The Ten Commandments,” the action centers around an invented love triangle involving Moses, Ramses, and Anne Baxter as the nostril-flaring Nefertiri. In the new “Exodus,” it’s all politics. Ben Mendelsohn plays a corrupt official who reveals Moses’ past to discredit him in so swishy a manner that it he seems he has involved the ghost of Franklin Pangborn. Aaron Paul is wasted as Joshua, who spends most of his time spying disbelievingly at Moses while he talks to his invisible friend God. Ben Kingsley is thrown into the mix for no particular reason at all, Sigourney Weaver has three lines, and the rest of the women’s roles are pretty much nonexistent. People come and go in “Exodus,” mainly to hold the space in between the effects sequences. Ultimately, Scott stakes the whole narrative on the contrast between Moses and Ramses. Bale wavers between his normative British accent in “Egyptian” scenes and some kind of pseudo-Brooklynese when dealing with the Hebrews, as though they brought him in touch with his inner S.Z. Sakall. He is so human as Moses as to be uninspiring. Meanwhile, Edgerton’s Ramses is so waspish, snotty, and passive-aggressive that after a while I thought he was doing a Ricky Gervais imitation. Deliberately. He is so lost in wimpy self-involvement that it’s a wonder he can summon up the energy to be the scourge of the Hebrews. There is zero dramatic tension generated, despite the smash-bang emphasis editing, and the portentously pointing scoring by Alberto Iglesias. 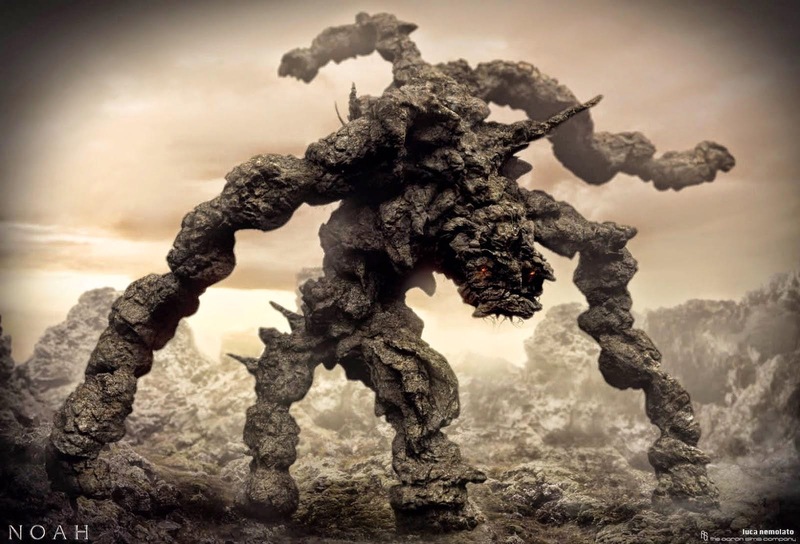 Of course, this story screams for CGI, and Scott is quite capable of making it as grand as we can stand. His visual imagination is so strong that, unless the material can stand it, the image drowns the idea underpinning it. In successes such as “The Duellists,” “Alien,” “Blade Runner,” “Black Hawk Down,” “Thelma & Louise,” and “American Gangster,” there’s parity. In misfires such as the Russell Crowe “Robin Hood,” “White Squall,” and “Legend,” what’s up there looks great but makes little sense. In this way Scott reminds me of another director, an expert genre stylist who faded when he moved into epics. Anthony Mann’s film noir and Western triumphs (“Raw Deal,” “The Naked Spur”) still overshadow the later big-scale efforts such as “El Cid,” “The Fall of the Roman Empire,” and “The Heroes of Telemark.” It’s almost as if these projects are so ambitious that the directors can no longer see the trees for the forest. Given the historic periods Scott chooses to work in, it’s frequently impossible not to think of Monty Python. It’s as if Scott’s films were made before the English comedy group’s satiric deflation of the epic form took place, instead of after. There is a bigger problem underlying the weaknesses in casting, the pretentiously serious tone, the incongruous dialogue (Moses refers to his thinking as “delusional,” and Moses and Ramses have a nice colloquy about the tricky economic impact of the liberation of slaves en masse), the old Moses-sees-the-Burning-Bush-after-getting-hit-in-the-head gambit, the nervy conception of God’s messenger as a surly 8-year-old, the honey-I-brought-the-nation-of-Israel-home-for-hummus denouement, and the Ten Commandments afterthought. It’s the nagging problem with Scott’s Skeptic Hero. In the Scott movies “Gladiator” and “Kingdom of Heaven,” the protagonist comes into the story alienated and distanced from his culture. Russell Crowe’s Maximus is a republican in an imperial time; Orlando Bloom’s Balian has no use for a faith that condemns his suicide wife to damnation. In these cases the tough-guy attitude of estrangement allows director and viewer to examine the film’s world with a critical eye, almost as if the heroes in these films were beamed in from our time, rigged out in full with modern rationalism and irony. This doesn’t work for Moses, though. DeMille’s Moses is two-dimensional; he is just as earnest and overwrought at the end as he is at the beginning. Exodus is on one level a fable, and only stereotypes carry the mythic freight of so ancient and well-known a tale. Thinking of Moses as a cynical action hero who swashbuckles first and asks questions later just doesn’t work. In the year’s earlier “Noah,” director Darren Aronofsky takes one of Scott’s favorite actors, Russell Crowe, and posits him as a proto-hippie patriarch. 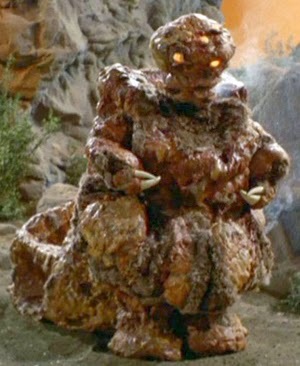 Despite the hallucinatory tang of the piece and some missteps such as the helpful golem/Nephilim, who resemble no one so much as the Excalbian in “The Savage Curtain” episode of the original “Star Trek” series, “Noah” maintains some coherence because Noah stands for something. Scott’s Moses always seems uncertain, provisional. At the end of “Exodus: Gods and Kings,” the ramshackle tribes of Israel clatter across barren waste towards a undifferentiated, hazy horizon. Moses is hauled along in a cart, his tablets clutched at his weary side. The 8-year-old angel gives him a manly affirmative head-bob before vanishing. It’s the saddest, most anticlimactic ending since “Lawrence of Arabia.” The lights went up in the theater, but I still felt in the dark.